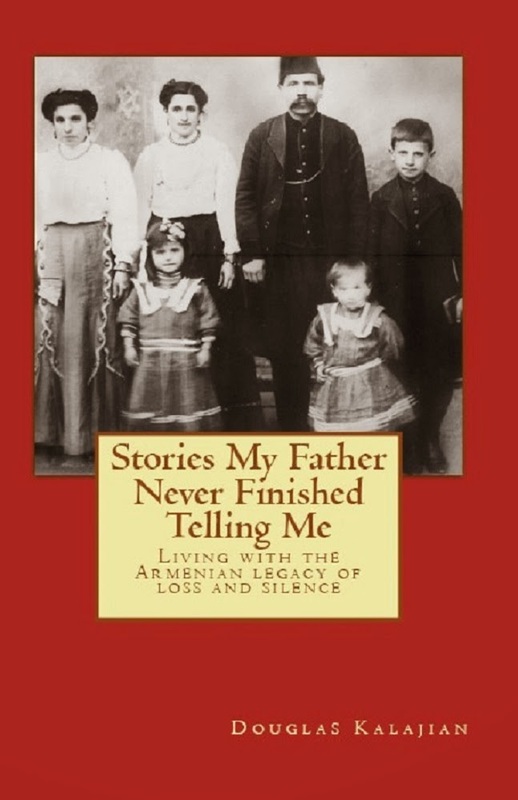 When I was probably six or seven, my father tried to trick me into eating lamb's liver by telling me it was Armenian fish. This was not so ridiculous. It looked more like fish than, say, like steak or chicken. I could have just agreed and moved on. But I was a skeptic even then. I'd eaten liver without protest since I was younger, but now I wanted to know the whole story. My mother obliged by explaining that it was really a form of meat, but that only led to more questions and then to the awful moment when she told me it came from inside the lamb. At that point, I wished I hadn't questioned my father's fish tale. My liver-eating days were over, but only temporarily. I actually liked lamb's liver -- fried up crisp, dusted with ground coriander and served with sauteed onions and a sprinkle of fresh-squeezed lemon juice. 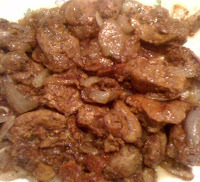 Lamb's liver is much milder than beef or even veal liver and yet it has a distinctive and delicious flavor. If you've never had it, you probably never will. Lamb's liver just isn't part of the American diet. You might have luck at a Middle Eastern or Italian butcher, or you might not. We've pretty much given up asking -- and I'm not interested in substitutes. Well, maybe one: chicken liver. If they're familiar with chicken liver at all, most Americans think of the pate-like sandwich spread served at Jewish delis. 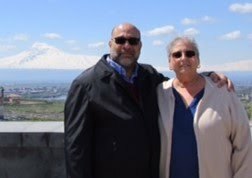 Armenians usually cook chicken livers whole, which means they at least resemble the traditional cubed lamb or beef liver. My mother made chicken liver often, but not for dinner. It was always an appetizer or snack because it's very rich, almost like eating butter. But even a small portion of chicken liver can be very satisfying. It makes a great meal served with rice along with bread and a salad. It's also ridiculously cheap, especially when you consider that a little goes a very long way. We bought about a pound and a quarter for $1.89 -- and nearly half was left over. So we satisfied three very health appetites for about $1. Like most livers, chicken liver is vitamin-rich and has only one real nutritional drawback: lots of cholesterol. We'd worry about that more if we ate bigger portions or served it more frequently. Trim connective tissue off the livers and cut larger pieces so they're all about the same size to ensure even cooking. Pat dry and dredge lightly in the flour. Chop onion and sautee in butter (traditional) or olive oil (healthy choice) on medium-high heat. As the onions start to brown, add the liver. Then add half the coriander, plus salt and pepper to your taste. Brown the liver about four to five minutes, then turn and add the rest of the coriander plus salt and pepper. Cook about another five minutes. It's done when the liver is brown all the way through but still soft. Note: You can serve this dish over rice or make sandwiches on lavash or pita bread with chopped parsley and onions. A French recipe book that I have (by Jacques Pepin) recommends par-boiling the chicken liver before frying it. I don't know if you ever tried it, but it makes the liver come out very soft, almost buttery. I also like the idea of using coriander. I'll have to try it. The traditional (so to speak) recipe for fried liver (tzhvzhik) only has onion, which I always thought was rather bland, although I could swear I saw a recipe that recommended adding red pepper paste. I have the same Jacques Pepin cookbook, and checked out the recipe. Have you tried his procedure? Dredging the liver with flour helps keep it moist and tender without the extra fuss. And......coriander is an absolute must in our household for this dish - and many others, too! I did try the parboiling method and, yes, it is a bit of a fuss. I guess the advantage is it gets rid of the extra blood and it does come out very soft at the end. I never tried dredging with flour. I'll give it a go, since I'm all for no mess no fuss. We live in South Florida where we don't have any farms as such; our neck of the woods is more agricultural which is great for things like corn, tomatoes, and strawberries. It's impossible to get lamb's liver, and the other innards aren't too accessible, either. Oh well, there goes our Pacha recipe! I know what you mean about liver, but every once in a while it's a treat, just the same. Hi Robyn, I tried your liver recipe (with beef liver) for dinner tonight and it was amazing! You were right, by the way. Dredging in flour kept the liver moist without having to go through the whole parboiling ritual. I had some adjika on hand (Georgian tomato/pepper sauce) and I first thought about using that instead of the coriander but then I decided to just try it your way and it came out really good. The coriander gives it a very subtle flavor. I made some nevik on the side (swiss chard and chick pea stew) for that extra kick of iron (swiss chard from yesterday's farmer's market). Added some fresh Armenian bread from the local bakery and some wine and it truly was heaven. All in under an hour. Really pigged out! I'm so glad you liked it! Now, I have a request... would you please send me your recipe for nevik? It sounds delicious, and we'd like to try it. Wash and coarsely chop the chards. Make sure you get all the dirt out. Heat the oil over medium-high heat and saute the chard until it is limp. Add the chick peas, tomato sauce, salt and peppers. Cover and simmer on low heat until the chard is soft but not "dead". About 20-30 minutes. Nevik is traditionally eaten on Christmas Eve (January 5th), along with rice, fish, and yogurt soup (madzoonaboor). This sounds terrific! It qualifies as a Lenten dish, too; no meat or dairy. Perfect! Thanks a bunch.